The biggest thing I miss about going back to school? The shopping. I still use it as an excuse to take advantage of the awesome sales & cute new fall pieces. For any of my college gal readers, I've rounded up my top picks for back to school. 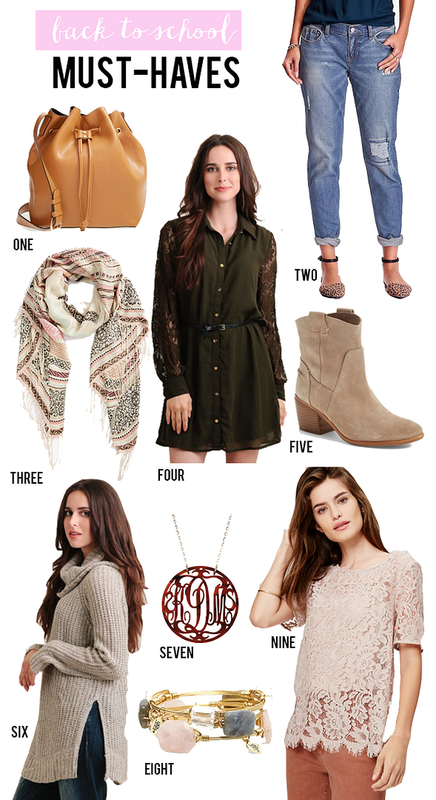 Mix & match these pieces and pile on the layers as the weather starts to cool off! Look for neutral pieces, subtle patterns, load of texture and denim in every silhouette. Don't forget putting the finishing touch on your look with accessories. 1. Leather Bucket Bag: This 90's silhouette is back and it's the perfect size for storing the essentials & matches with everything! 2. Cuffed Boyfriend Jeans: Choose a pair with a slightly tapered silhouette to keep them from looking sloppy. 3. Fringe Scarf: This subtle pattern complements any color palette! 4. Green Lace Shirtdress: This hunter green hue can get layered up with tights & boots or a chic cardigan when temperatures dip. 5. Tan Ankle Boots: This neutral colored boot goes with absolutely everything. It looks cute with skinny jeans or a fall floral skirt. 6. Oversized Sweater: This oatmeal knit sweater is oversized, but not sloppy. Pair them with tight jeans or ponte leggings & boots for a super cozy chic look. 7. Monogram Necklace: Monograms are one of my favorite classic jewelry pieces & I love this preppy, tortoiseshell style. 8. Bourbon and Boweties Bangles: These chic stone bangles are perfect for stacking- the more the better! 9. Lace Tee: I can't stop wearing this pale pink hue. This lace top dresses up a pair of jeans but is perfect for a night out with a faux leather skirt. A few of the trends I'm loving for fall include tons of texture like cabled sweaters and pebbled leather, special details like tassels, fringe & gemstones and a muted earth tone color palette. Are you headed back to school this year (or do you just wish you were for an excuse to buy new clothes)? I love that buck bag so much! I am saving up to buy one very very soon! I love that scarf! I haven't gone shopping for new clothes yet - those textbooks absorbed most of my money, haha! That pale pink Lace Tee is beautiful. I'm not headed back to school but I'll be window-shopping the styles and sales - I might not be able to resist.